The last holdout in a long-running land dispute with the developer of an NBA arena agreed Wednesday to sell his home on the site for $2.4 million more than he paid for it a few years ago. Daniel Goldstein and his family agreed to leave their Brooklyn condo by May 7 in a settlement in court with developer Forest City Ratner Cos.
Goldstein said he bought the condo for $590,000 in 2003 and will receive $3 million for it. The sale is doubly surprising because Goldstein founded Develop Don't Destroy Brooklyn, and was the Atlantic Yards development project's most vocal critic. Under the terms of the settlement he can no longer be the spokesman for the group, but he said he will still be involved with it. "The fight and the opposition to the project will continue," Goldstein said. Seven other families living in the footprint of the 22-acre Atlantic Yards development project agreed Tuesday to leave. Forest City Ratner "has from the start worked very hard to compensate and to assist residents who owned or rented homes in the footprint," developer spokesman Joe DePlasco said in a statement. 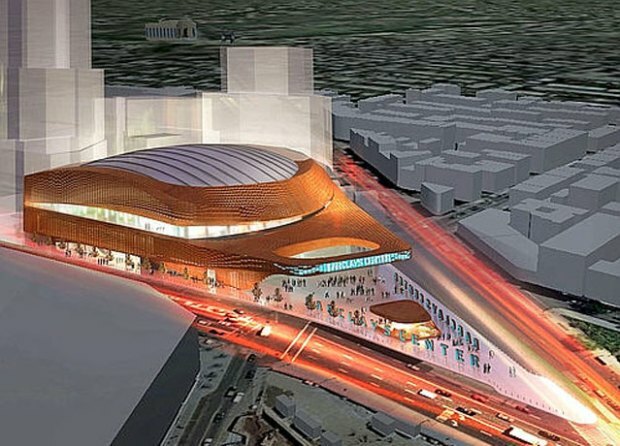 Ratner plans an arena for the New Jersey Nets, who will become the Brooklyn Nets, plus 16 residential and office towers. The 18,000-seat arena is to open in 2012. Ratner last December finalized a deal to sell 80 percent of the Nets and 45 percent of the arena to Russian billionaire Mikhail Prokhorov.